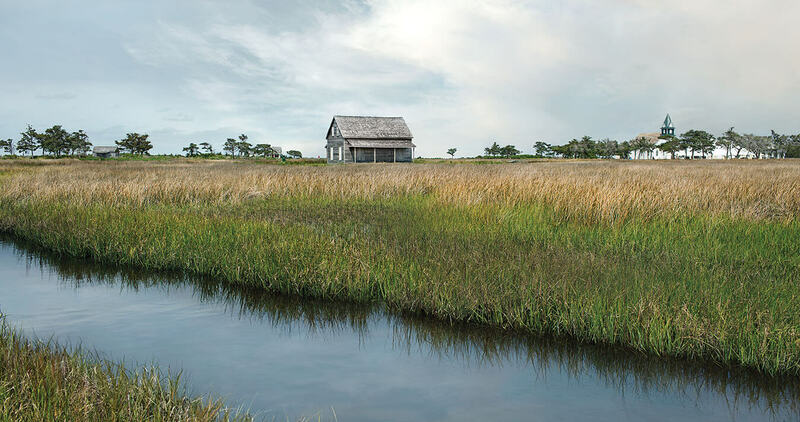 An old church bell rings, and an abandoned barrier island springs back to life. For those who make the biennial journey to this once-bustling shipping and fishing village, there’s comfort in the ritual of remembering. With the cool dawn mist still hanging in the air, a small group has gathered by the docks at Silver Lake, Ocracoke Island’s cozy marina, clutching their cargo: tinfoil-covered casseroles, homemade pies, and poster-board signs printed with surnames once well-known in these parts. They step onto a small fishing boat and secure their potluck dishes as best they can for the bumpy trip across Ocracoke Inlet. In every even-numbered year since 1992, Portsmouth Village, an abandoned island community on the northernmost point of Cape Lookout National Seashore, has hosted a homecoming for former residents and their descendants. What began as a small gathering — that included seven people born on the island — has grown into a celebration for some 400, many from a new generation of relatives and island admirers, ready to uphold the history of this special place. 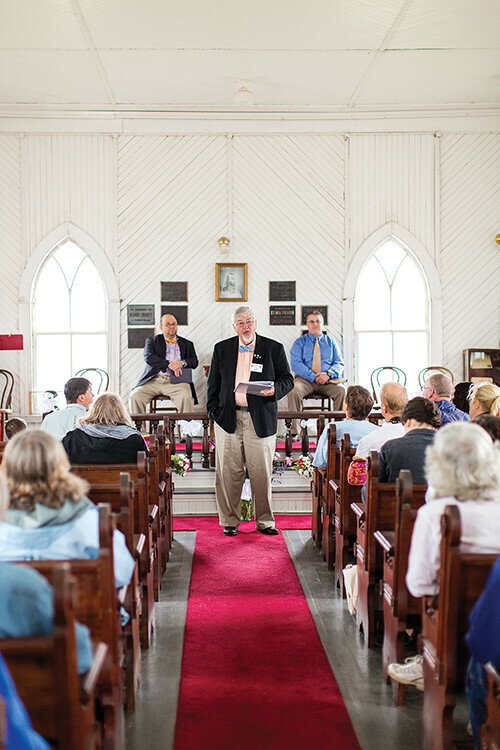 Pulled by family ties and stories of the island’s harsh beauty, those who made the journey fill the pews at Portsmouth Methodist Church, where hymns once again rise to the rafters. “There are people here today that we can see, and people we cannot see,” preaches the Rev. Ivey Belch of the Ocracoke Assembly of God. Daylight filters through the chapel’s peaked windows, making the herringbone-paneled walls glow white. This brightness and the distant calls of seagulls hint at the great expanse of sea and sky just beyond. Inside, a small portrait of Jesus is surrounded by plaques honoring those present only in memory: Elma Dixon, Henry Pigott, and Marian Gray Babb, the last people to live on this remote barrier island. On this day, the church will host two christenings, adding two new lifelong connections to Portsmouth, and proving that this uninhabited village is not, in fact, frozen in time. 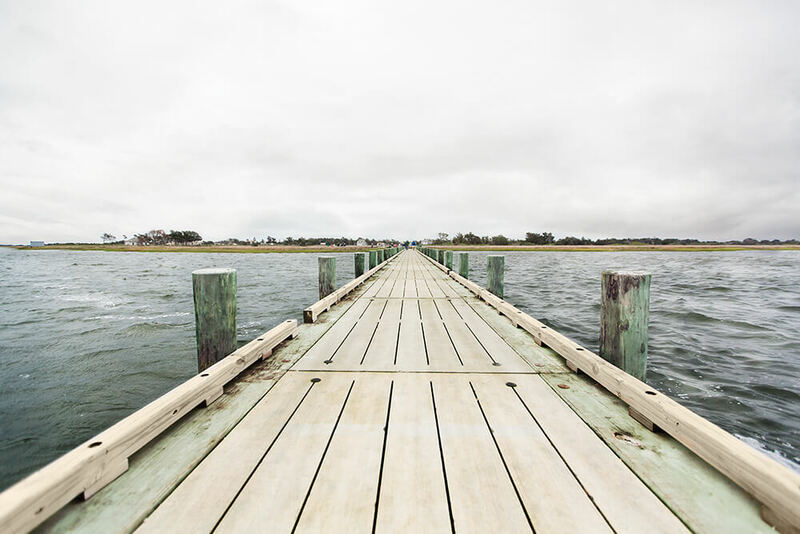 Rather, it is caught in between: Every summer its winding paths are newly explored by tourists, and once every two years, the old church bell rings for those who want to keep the island’s past — the stories, people, and traditions — alive. Dot Salter Willis, one of the last people born on Portsmouth, was a fierce advocate for the preservation of her birthplace. At age 71, she helped establish the first homecoming, where her lively recitation of island history was a highlight. No doubt Dot introduced more than a few curious visitors to the term lightering, the practice of using smaller boats to “lighter” a ship’s load by removing cargo, thereby lifting heavy hulls just enough for safe passage through shallow waters. Founded in 1753, Portsmouth Village once had a prime location in a busy shipping lane: In the early 1800s, two-thirds of North Carolina’s exports left Pamlico Sound for the Atlantic through Ocracoke Inlet, but big commercial ships couldn’t navigate the inlet’s shallows without the help of lightering boats. In 1846, a massive storm created Hatteras Inlet, a much deeper passage that changed shipping routes forever. By 1860, 685 people lived on Portsmouth, and there were more than 100 buildings. But the boom was short-lived, as hurricanes repeatedly battered the village. During the Civil War, the island survived two occupations, and by the late 19th century, residents, including freed slaves, began moving away in droves. Those hardy souls who stayed year-round earned a living by fishing. Still, by 1959 so few people remained on the island that the village post office closed. Today, strolling along the sandy lanes is a walk back in time. Portsmouth looks much like it did when its last residents left in 1971. The old schoolhouse with its neat rows of desks, the life-saving station, and several cottages remain in the care of the Cape Lookout National Seashore and volunteers from Friends of Portsmouth Island, the non-profit that hosts the homecoming. On a bright April morning, the day before the 2016 homecoming, Chester came to the island to decorate the church’s small sanctuary with white ribbons and fresh carnations and daisies. He wanted to set a beautiful scene for the next day: This year’s homecoming would begin with the christening of his great-nephew Bryson Silas Reitz — a new generation added to the Portsmouth fold. Siblings Russ and Teri Carter of Virginia have brought eight family members to the homecoming. For them, the event is both a family reunion and a way for their children to learn about their heritage. Their great-great-grandmother Rose (Ireland) Abbot, the only freed slave to remain in the village as the population dwindled, made her living as a midwife and nurse, and fished and oystered on the side. On homecoming day, the Carters walk the meandering paths to the tidy little house with a steep roof that Rose bought in 1904. “I’ve personally been back all 10 times since the 1996 homecoming, and various other times,” Teri says. Rose’s grandson Henry Pigott, one of the island’s last permanent residents, took over the little yellow house. After the island post office closed in 1959, he became the mailman, and poled his shovel skiff into Ocracoke Inlet to meet Chester’s grandfather with the mail. “I’m not sure which one of us is crazy,” Henry reportedly told a writer visiting from New York City, who had asked him why he chose to remain on Portsmouth while so many others had moved off the island. Henry is such an important character in Portsmouth’s story that David makes sure to give him his due — as his grandmother did before him — at the homecoming history recitation: “The beat of Henry Pigott’s heart became the beating heart of the island,” he says to the crowd. In 1970, Henry became seriously ill and moved to Ocracoke to live with a friend. When he passed away, his fellow islanders realized they could not go on without him. His boat, and the supplies it carried, were a lifeline for Marian Babb and her aunt Elma Dixon, who were the last remaining residents. Russ believes that Henry may have found peace from racial strife on the isolated island, explaining, “Some of the stories I’ve heard — it was a different environment on Portsmouth. It wasn’t quite like the mainland.” At this homecoming, Russ took over one of Henry’s sacred duties: ringing the church bell at the close of services. “We’re keeping the tradition alive,” Teri says. As the web of direct descendants grows more complex each year, the stark beauty of the island pulls in new “family” as well. The 2016 homecoming was something of a 30th wedding anniversary for retired park ranger Rebecca Harriett and her husband, Rob Lamar, both of whom had spent time working on Portsmouth. “The very first time I drove up the beach, I saw the church steeple, and in my mind I thought, ‘Man, if I ever get married, I want to get married in that church,’ ” Rebecca says. “I didn’t even know Rob then.” In 1986, they were, indeed, married in the village church. They coordinated boat rides from Ocracoke for their wedding guests, and when the ceremony was over, they all played a game of croquet on the lawn. 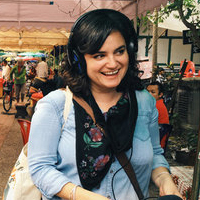 Katy Clune is a communications consultant and digital editor for Southern Cultures.